Located to the north of St. Louis on US 67, Jersey County covers over 240,000 acres and is predominately rural. 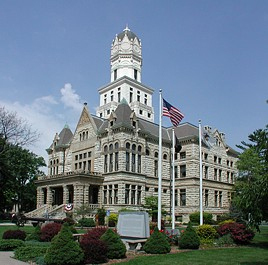 Jerseyville, the county seat, is the largest municipality and offers shopping, restaurants, recreation and a friendly atmosphere for visitors. Grafton, a tourist town along the river, is the second largest municipality and located on Illinois 100, part of the National Scenic Byway called The Great River Road. The Mississippi River delineates the southern edge of the county and the Illinois River along much of the western edge. The bluffs of Pere Marquette State Park overlook the confluence of the Mississippi, Illinois, and Missouri Rivers. Free Discount Prescription Cards are available for Jersey County residents in the lobby of the Jersey County Government Building, County Clerk, County Board, Assessor, Treasurer, or Recorders offices, located at 200 N. Lafayette St. in Jerseyville, or ask for it at your local pharmacy.